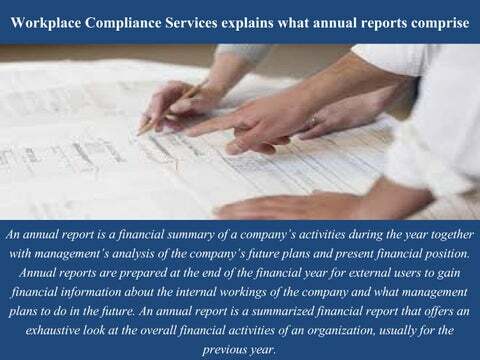 An annual report is a financial summary of a company’s activities during the year together with management’s analysis of the company’s future plans and present financial position. Annual reports are prepared at the end of the financial year for external users to gain financial information about the internal workings of the company and what management plans to do in the future. An annual report is a summarized financial report that offers an exhaustive look at the overall financial activities of an organization, usually for the previous year. An annual report has lots of uses, including enabling business executives and stakeholders to see just how well an organization is performing. What does an annual report comprise? There are numerous things can be included in an annual report. Explained below are some of the things that are included: â&#x20AC;˘ The financial statements contain information in regards to the financial health and performance of an organization. If executives, stakeholders, or investors wanted to ask as to in what way an organization is performing. Even though financial statements across industries and organizations might differ, most of them will comprise an income statement, a balance sheet, in addition to a statement of cash flows. â&#x20AC;˘ Based on how long an organization has been in business, an annual report may comprise a summarization of financial performance for this specific period of time. This is chiefly helpful when executives of a company are looking at the larger picture of the development of a company as years and decades have passed. â&#x20AC;˘ Marketing area of the annual report lists information about an organization's services or products, based on the industry. This area of the report will also assist to differentiate between an organization's diverse divisions. â&#x20AC;˘ The annual report will usually include a letter from the chief of an organization. This memo or letter will comprise goals for the upcoming year and beyond while discussing the performance in the earlier year. These letters are optimistic in tone and designed to notify employees and stakeholders of how management views the annual report generally. â&#x20AC;˘ The annual report explains shareholders what the strategy of the company is for increasing revenue in the coming year. This is typically outlined in the letter to shareholders. It is meant to offer shareholders an idea of what way the company is going in, for instance expanding in foreign or domestic markets, or launching new products. The objective of the annual report is to show shareholders that they are significant continuing to invest in. For shareholders, the financial report is a very important decision-making tool, enabling them to determine whether their investment is offering a good return, or whether their dollars would be better invested somewhere else. With more than two decades in the industry, WorkplaceCompliance Services is a business to business company which helps businesses to stay in compliance with periodic, biennial, in addition to annual filings that are very vital in businesses. 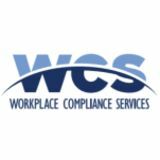 WorkplaceCompliance Services Annual Report can be of great assistance for those companies who have an existence in many states.